Building a CSS framework to be used across multiple product is an easy thing. Making sure developers use it in the right way was always the challenge. Raise your hands if you wasted so much time refactoring code that other developers created because they didn’t know proper CSS, proper html semantics nor how to follow accessibility guidelines. Using Css as a testing tool for our HTML. 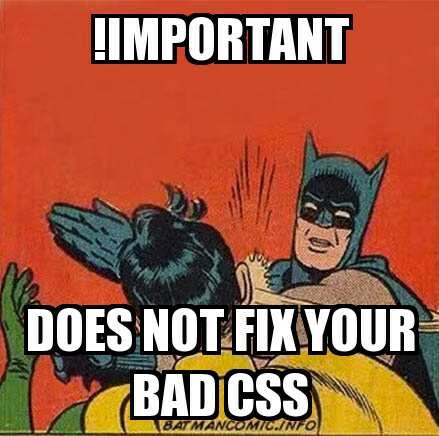 I’ll be using SCSS for this tutorial but if you are using anything else it shouldn’t really matter. This is how my SCSS folder structure looks like. Basically, I’ll be adding a specs file for each SCSS module and ill be importing and compiling a separate stylesheet for them that will only be used on my development environment. Lets start by creating the styles of how we will display our CSS issues, so it will be just a box that shows on top of the element that has an issue, I’ll also created them as mixins for re-usability . YES! it’s that simple, you can test anything with the :not() selector !! There you go! Less code review for the CSS guru on the team , less code refactor and more productivity and consistency. Let’s now talk now about how to enforce HTML and accessibility structure. Some of you might not agree with this method, I’m pretty sure if you are a BEM supporter you wouldn’t want this technique in your framework. Basically this technique is to make CSS only target specific elements and specific html structure. If a developer adds a CSS class to an incorrect HTML element it basically won’t be styled, so lets look at an example let’s say buttons, in our previous example. We warned the user if an element doesn’t contain the attribute role='button’ but it still looks like a button. Now how about we create the styles to only affect buttons so if a user tries to use .button class on a div the styles wont be even affected. Let’s look at the code, I just specified which element this class should always affect. As you can see the div has no longer any style applied to it and our and our css gave us a warning. As you can see from our SCSS. if you even change the order of the input with the label, these styles won’t be applied and if you forget the for attribute it won’t still be applied. So using this method you can see how you can force the same Html code structure across you product(s) and enforce accessibility guidelines!